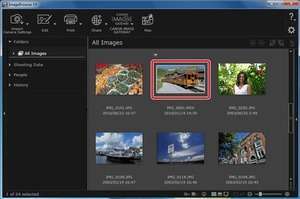 ImageBrowser EX is an image management software program for Canon's digital cameras and digital camcorders. This software makes managing and searching for images shot with cameras and camcorders very easy. Please utilize the software for editing, printing and sharing images. ImageBrowser EX can be installed simultaneously with ZoomBrowser EX/ImageBrowser. Version 1.4.0.5 is a freeware program which does not have restrictions and it's free so it doesn't cost anything. For security reasons, you should also check out the ImageBrowser EX download at LO4D.com which includes virus and malware tests. Additional screenshots of this application download may be available, too.